I fell in love with Poland years ago. . . but first I fell in love with my wife. Ever since that first trip to meet her family for the first time, we have been following a pretty reliable travel schedule where we pass the winter holidays with her family every other year. The peaceful forest above tunnel complex Osówka near Głuszyca in the Owl Mountains. Every time we are there I discover something else that is visually beautiful and often historically important. One of the most impressive space at Osówka, long open space reminiscent of a nave with a ceiling nearly three stories tall. The wooden structure rising up the walls into the ceiling is actually the formwork for the actual ceiling, which is made of concrete. 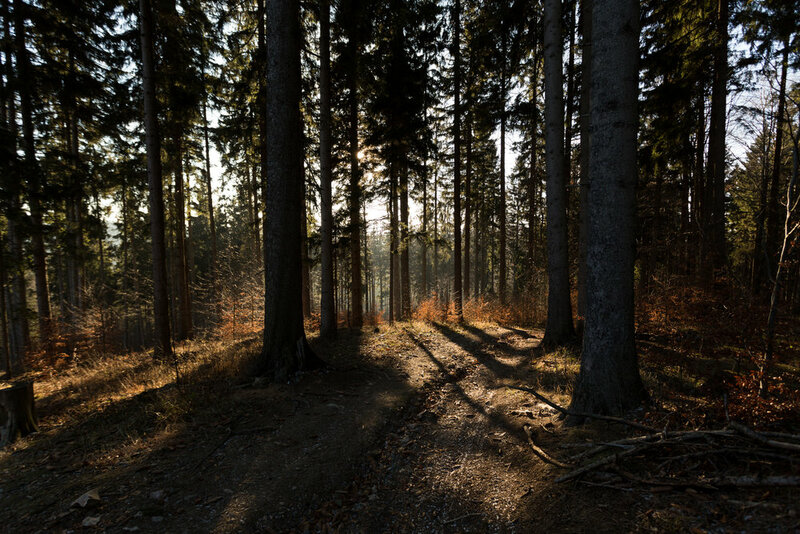 Recently during one of our trips we spent some time in the Owl Mountains in Lower Silesia, where both of her parents grew up. Toward the end of WWII, below those mountains the Nazis were busy creating a network of tunnels. 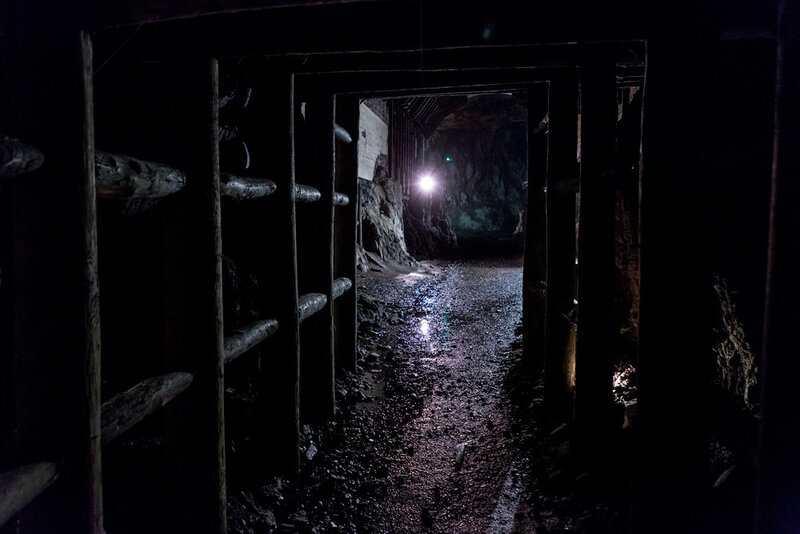 Project Riese (German for giant) was a network of tunnels that may have been intended as an escape route, but the details are unclear and some of the tunnels and their secrets have yet to be unearthed. An incomplete portion of the tunnel network at Complex Osówka. This portion of tunnel overlooks a space more than two stories tall that stretches in a long corridor. 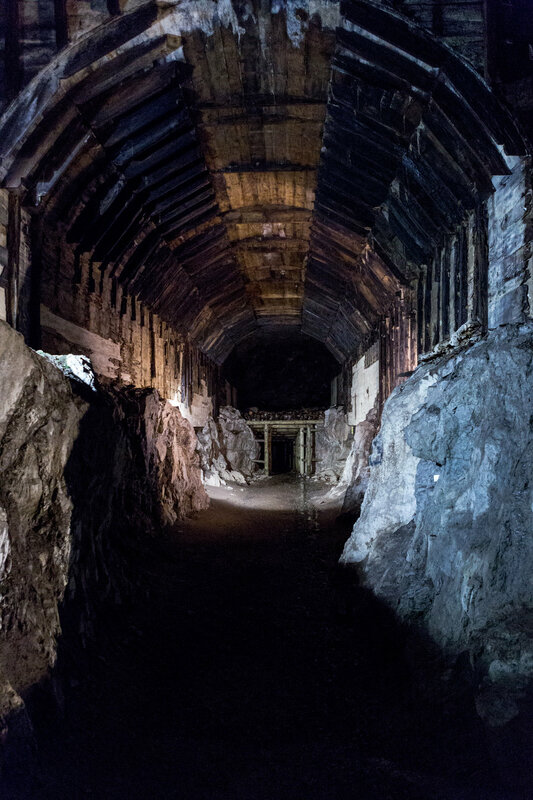 We toured two of the tunnel complexes Osówka, and Włodarz. Being underground always carries a somewhat otherworldly quality. 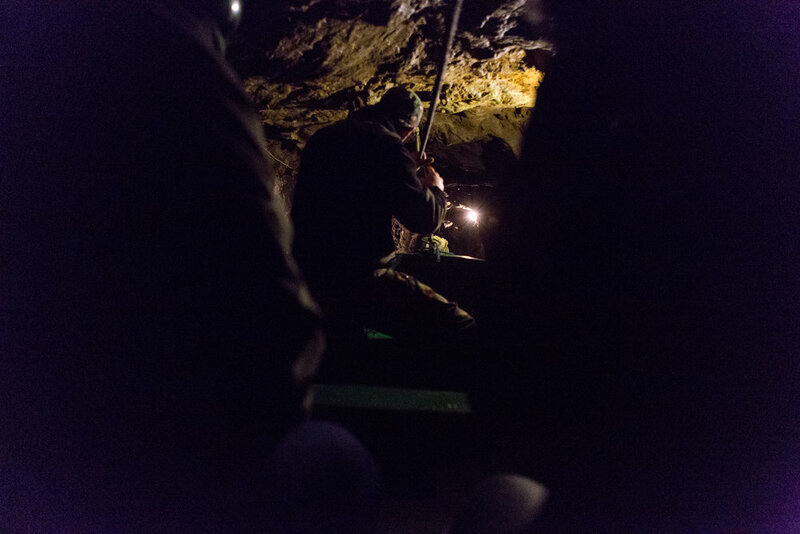 I have toured a couple of mines here in the United States and also in Poland, I am not claustrophobic but it usually takes a few minutes for the mind to accept the many tonnes of earth above your head. But the historical context makes these passages even more strange and alien. Portions of the Włodarz complex are partially submerged and can only be traveled by boat. A literal river Styx has to be traveled through part of Complex Włodarz. Some of the tunnels are partially filled with water and our tour guide packed us into a tiny boat and pulled us through increasingly tight passages -- all hands were to be kept on the boat, to lazily rest them on the edge of the boat would be to guarantee the loss of some skin as the boat bumped rocky walls through some tighter stretches. Passing through some narrow areas in the small boat required us to crouch down while we sat in our small boat. The real function of the tunnels may not have been an escape route. The underground areas are large enough to suggest that once completed it could have housed a city's worth of people. The tunnels were likely not a means to escape through to another place, but rather a place to escape to. As with much of history the specifics are fuzzy and the human mind fills in many blanks. The theories revolving what may or may not be hidden in some yet unearthed portion of the network include a train car filled with stollen gold. Some small passages that connect larger chambers are braced with wooden supports. Sometimes it's easy to ignore the ceiling. It's always a good idea to look up when sightseeing, there might be a special visual treat the architects want you to notice. Whether it's a large landmark, store, restaurant, or someone's home, somebody gave that oft ignored ceiling some thought. Those small, or large details sometimes make for just as interesting a photograph as the front facade might. Dresden is a city that lived at the edge of my imagination, but without distinct shape. A fuzzy blob shape created from history book and Vonnegut pages. The reality is a beautiful city of breathtaking architecture made even more remarkable by the fact that so much of it was destroyed in February of 1945. The Procession of Princes mural, 102 meters of porcelain tiles, survived the bombing largely undamaged. More photos from our, all too brief, trip to Dresden can be seen on my Flickr feed.